WMG Academy is an inspirational new University Technical College (UTC) in Solihull that was developed to provide training for young aspiring engineers. WMG Academy is an inspirational new University Technical College (UTC) in Solihull that was developed to provide training for young aspiring engineers. Maber Architects was awarded the contract to design the facility and BAM Construction secured the contract to manage the construction works. Tobermore helped complete the design and build project with the provision of a beautiful paving solution in the form of Textured Flags and Fusion block paving. The academy was created from a powerful partnership between the WMG Academy for Young Engineers Trust, Solihull Metropolitan Borough Council, Jaguar Land Rover, National Grid, SCC, Balfour Beatty, Arup, Controls and Data Services and more than 20 other local and national employers, Solihull College and local schools. The facility was developed to provide a ‘business led’ learning environment for 14-18 year olds that feels less like a school and more like a modern workplace. The building was constructed with dark brick and so a hard landscaping solution with a bright, contrasting aesthetic was needed to create balance on site. 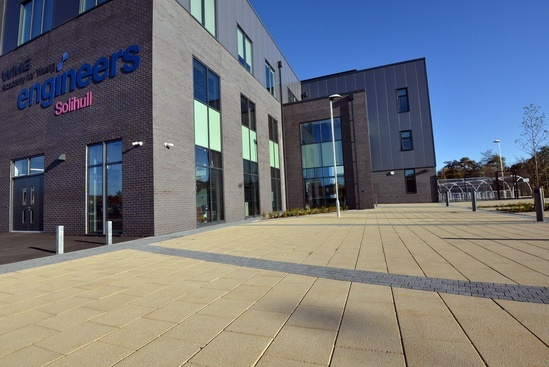 Paving was selected as an appropriate material and Tobermore’s vast range of paving product colours and finishes provided ample choice for Maber Architects. Tobermore’s Textured Flags, which are manufactured with a natural, granular surface, were specified for the scheme in the rich colour of Buff. Fusion block paving in the classic colour of Graphite was added to the design to act as a bordering product alongside Textured Flags. Fusion is produced with a striking granite aggregate surface layer that products a modern look similar to natural granite. 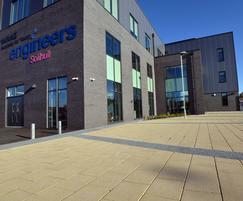 Tobermore’s Country Edge was also specified as a method of separating the paved areas on site. Country Edge was a complementary edging choice as it is manufactured with a granite aggregate surface like that of Fusion. WMG Academy is now open and is set to cultivate the UK’s next generation of automotive and aerospace engineers. Fusion is a premium granite finish modular concrete block paving system produced in a wide range of colours in 60mm and 80mm depths.